Believe it or not, this reviewer is still holding on to the cassette of 1991’s Beauty and the Beast. The 2017 release of the live action movie just means one thing: it is time to revisit the tale and the music, both as old as time (before you wonder where this writer is going to get a cassette player in this day and age – he does also have a CD version of the soundtrack). There were 50 minutes of music spread over 15 tracks in the beloved album. The first half contains the movie’s musical numbers writer by composer Alan Menken and lyricist Howard Ashman, while the second half features Menken’s Oscar winning score. 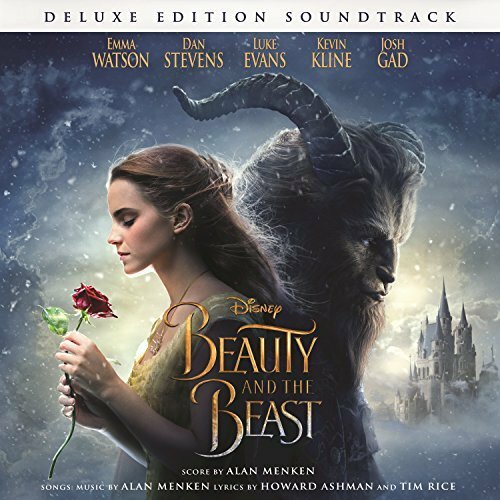 If you didn’t already know, the titular track “Beauty and the Beast” also took home the Academy Award for Best Original Song. Enough reasons to be excited about this deluxe edition soundtrack of the 2017 film directed by Bill Condon? You bet. Disc One contains 63 minutes of songs spread over 24 tracks. If you are a fan and already remember the 1991 tunes by heart, you will be pleased to hear Emma Watson giving a distinct character to “Belle” and Belle (Reprise)”; Josh Gad and Luke Evans crooning to the hilarious lyrics in “Gaston”; Ewan McGregor, Emma Thompson, Gugu Mbatha-Raw and Ian McKellen performing the big show number “Be Our Guest”; Watson and Dan Stevens sharing a romantic moment in “Something There”; Evans and Gad rousing heated emotions in “The Mob Song” and of course – Thompson singing to you that “Beauty and the Beast” is “tale as old as time” and “song as old as rhyme”. Fans who have put the 1991 soundtrack on repeat for the last 26 years may spot several alterations to instrumental arrangements and changes to lyrics. The performers may also not meet the vocal heights of original voice cast members like Paige O’ Hara (Belle), Richard White (Beast), Jerry Orbach (Lumiere) and the perfect Angela Lansbury (Mrs Potts). But be assured that the new renditions of these songs still deliver musical movie magic. There are also new songs written for the 2017 movie (lyrics by Tim Rice) which you will find on Disc One. “How Does a Moment Last Forever” is a lullaby performed lovingly by Kevin Kline in the “Music Box” version and Watson in the “Montmartre” version. Celine Dion (who sang “Beauty and the Beast” with Peabo Bryson during the 1991 movie’s end credits) performs the beautiful radio edit here. “Days in the Sun” is performed by the enchanted objects in the movie, while Stevens’ Beast sings the soulful “Evermore” (Josh Groban is the perfect choice for the radio edit). If there is one thing we have some qualms about, it would be the choice to have Ariana Grande and John Legend perform the radio edit of “Beauty and the Beast”: the end result seems a little too contemporary for comfort. Disc One is rounded up by five of Menken’s demo tracks (it is a trend to include demo tracks in the deluxe versions of soundtracks to make up the bulk). Soundtrack fans will also rejoice at the fact that there are 69 minutes of Menken’s score on Disc Two. There are references to the songs throughout the score, and if you are familiar with the Disney’s Broadway production of Beauty and the Beast, you will recognise the nice touch to include “Home” from the stage version. It has been a while since Disney spoilt its fans with such an immersive musical experience. With the many live action adaptations of Disney’s beloved classics coming up, we hope we can continually be spoilt with such lovely soundtrack albums.